Historical experience suitable for all ages. You need to call ahead to arrange a tour. Ask about the special ‘Happy Tuesday’ rates for tours without paying the extra for the guide. We had a special morning at Kfar Kedem; with the promise of a donkey ride the children age 2-10 were all looking forward to coming. Firstly, Kfar Kedem is very pretty, lots of shade from trees which are all from the Shivat Haminim (7 species). We were soon welcomed by our guide Amir who spoke fluent English (and Hebrew) and told us how we were going back to the times of the Mishna and how, in neighboring Tzippori, R’Yehuda Hanasi had compiled the Mishna. We all put on garments like in Mishna days (well, except the 2 year old who refused!) and went on a tour through various stations to reenact life in Mishnaic times; we milked a goat, made cheese, made pittot, ate pittot and humous and of course rode donkeys. Amir was patient with the kids and spoke at the right level. There is definitely something here for all ages (I know that the teachers from our school recently went for a staff trip so it can be suitable for adults and teens as much as young children). It is value for money – definitely one that you will all remember fondly for a long time. Highly recommended as a day trip or as part of your trip in the North. We had an unbelievable time at Kfar Kedem mostly due to our AMAZING guide, Amir. We got dressed up, milked goats, made cheese, grinded wheat, and to top it all of we made delicious pita breads with chummus. With Amir because he was so knowledgeable and kid friendly. We had an awesome time!!!!!! I also forgot to mention how great it is that it’s only about 2 hours from Jerusalem. We liked how we were able to go a little north and still keep it as a day trip. I wanted to post about the great experience we had this past January in the LOWER GALIL. We first went to KFAR KEDEM and had a great time learning about the original way bread was made, then making our own pita and dipping it into a hyssop dip. We sheared a sheep and spun the wool into thread. We also make cheese, had some amazing tea along with fresh delicious pita, dips and cheese in a cozy heated tent, and went for a cute donkey ride- which were all the activities available in January. Our guide was amazing at navigating us through the on and off rain so even though it rained very hard at times, we did not get wet at all. 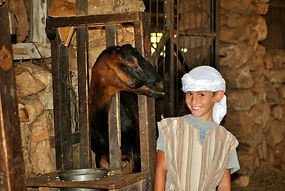 We’ve been to Kfar Kedem with a 2 year-old and we’ve been with a group of toddlers to teens, something for everyone. Little kids will especially enjoy the donkey rides, you can feel like a real biblical family leading your little ones mounted on a donkey through the path in the adjacent woods. Our girls are almost 7, almost 5 and almost 2. We went to Kfar Kedem in Mitzpe Hoshaya. 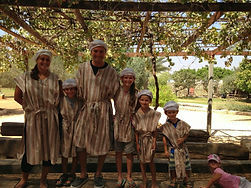 We dressed up in clothes from time of Mishna, saw sheep shearing, goat milking, cheese making, agricultural toole, made pittot, donkey riding and a treasure hunt. Book before you go. Starts at 11 and we left at 3 after picnic lunch. All visits MUST be prebooked by email or by Phone.